Bexley Council had a high rate of residents presenting as homeless. Following a recent redesign of their council offices on online presence, the service suspected that the way in which their service had been designed was acting as a barrier for service users to access support. They believed that in many cases, they could have intervened earlier, and stopped their service users from actually becoming homeless. The issue was compounded by the fact that an imminent change to national housing legislation (the Homelessness Reduction Act, 2018) meant that the council were at risk of being non compliant. We ran the discovery phase with a range of front line professionals, service users and managers over the course of a three day hack event. The event included training drawn from our Service Design Master training on how to gather insights. Together with council staff, we spent time observing how service users interacted with the service in the housing options centre. We interviewed service users and followed a range of cases through the system (literally following it through the system on foot from end to end). These insights were turned into a range of personas, customer journey maps and empathy maps. Our critical insights were that the Housing Options centre was laid out was creating confusion, there was no formal queuing system and service users often had to disclose extremely private information in what felt like a very public space, and this was leading to many people leaving the centre before actually being seen. In addition, the online system to register a housing need was so confusing that service users often weren’t providing crucial information that would have given housing professionals the information they needed to intervene early to avoid the individual becoming homeless. 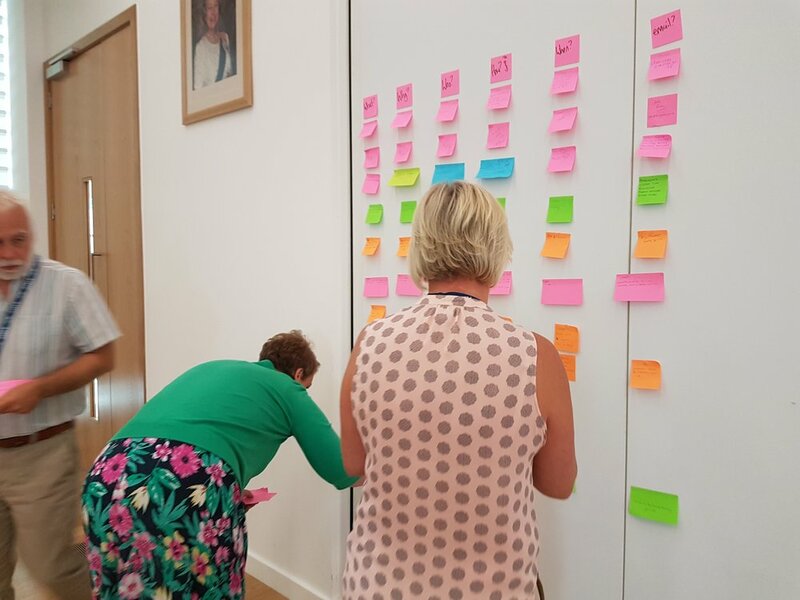 We brought a multi-disciplinary team together which included front-line housing staff with an understanding of housing legislation, members of the council’s transformation team, senior managers and members of the IT team and ran a three day sprint to come up with ideas to resolve these issues and to put them in action. Together we redesigned the layout of the Housing Options centre (we started out with a new blueprint of the space, took it to senior managers for sign off and and implemented it overnight), we designed and put in place a queuing system, and redesigned all of the online homelessness forms (all within the two day period). The council is now meeting need within the Housing Option centre consistently, is identifying those at risk of becoming homeless at the earliest stage through the new online process, and is compliant with the HRA.